On a recent trip to Manhattan I had dinner reservations at one of my favorite restaurants, Balthazar. I often use recipes from the Balthazar cookbook at home. I take every chance I can get to have dinner at Balthazar so that I can compare my presentation with the actual dish. This may sound funny but I have a before Balthazar ritual. I get off the subway on Prince Street and make an a-line to Prada. The Prada in Soho is my version of a New York museum. I love to take half an hour to admire the handbags and shoes. I then find my way to Dean and DeLuca where everything always looks absolutely fresh. Each apple seems to have a the most bright shade of green imaginable and each peach has the most perfect, soft fuzz. I could spend an hour in their browsing though the unique jams, teas, and cheese. This particular evening, I came across Plum Smoked Tea Compote. It sounded so interesting that I had to purchase a jar. After I strolled though Dean and DeLuca, I realised that all of my senses were open and I was hungry. I walked like a proper New Yorker; on a mission, head down, brisk, not letting anything or anyone get in the way of me and my lovely date with Balthazar. ‘Luxedo’ takes your taste buds on a velvety voyage with Black Bush’s racy notes of dark caramel, toffee and bitter-sweet chocolate. The journey continues with subtle nuttiness in Amaro Nonino, Firelit’s rich coffee bean, followed by juicy plum with a lingering hint of smoke. Add all ingredients to a beaker with ice. Stir well. Fine strain into a rocks glass over ice. 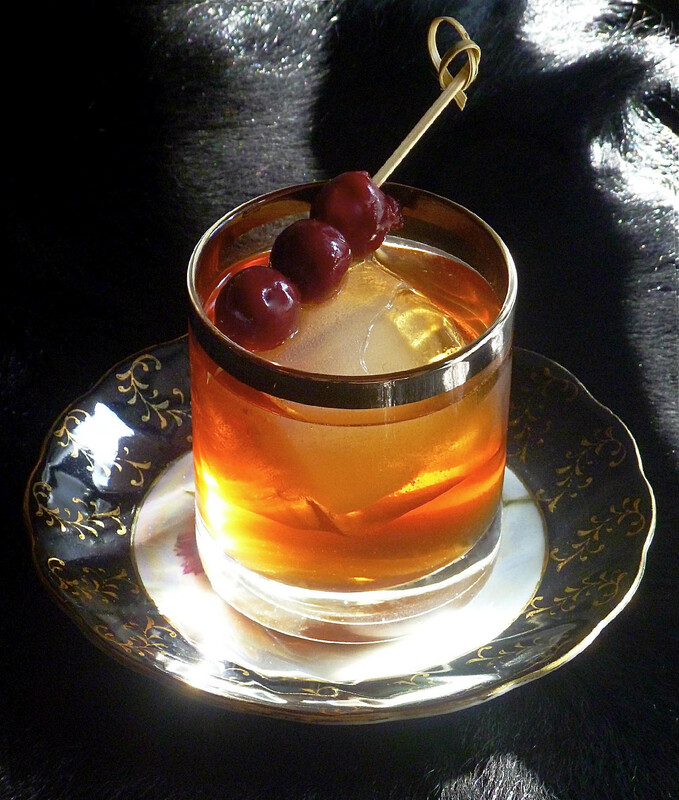 Garnish with brandied cherries. Cheers. Plum Smoked Tea Compote can be found here.